As we close in on the first 100 days, the view from moi's roof provides an additional perspective on Performing Arts re-construction. Portions of the new and significantly smaller parking lot are about complete. Additional exterior walls were erected along Ferry Street and some of the second floor windows along Woodlawn Avenue were removed, for interior demolition. 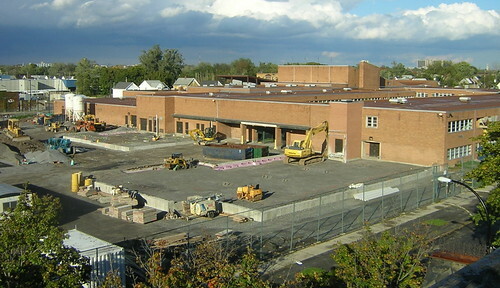 Here, the fence is running along Woodlawn Avenue in the foreground and the foundations for the Arts and Science wings are beginning to emerge. Following the line of the auditorium you can also make out the roof line of the new main entrance in the background, along Ferry Street. Update...Saturday morning, 11am. Sounds of demolition across the street all morning. Geoff Kelly and the crew at Artvoice have been helping to keep the message generated by PUSH Buffalo in the local spotlight. Here's Geoff's - Pataki Fiddles, Buffalo Burns, a must read, in this week's issue if you want to get grasp of what's going on in Buffalo's neighborhoods. 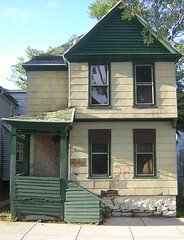 For the past six months, People United for Sustainable Housing (PUSH Buffalo) has been waging a guerrilla war against the State of New York’s Municipal Bond Bank Agency (MBBA), a division of the Housing Finance Agency which holds the liens on 1,499 tax-delinquent properties in the City of Buffalo...“It’s a house of mirrors,” said Eric Walker. Too bad that two of the 1499 properties that Geoff writes about are in Artspace's backyard - 28 and 39 Coe Place. Here's the on-line and searchable spread sheet I created listing all 1499 properties in Buffalo currently being held hostage by our good friends in Albany - Hostage List. Wonder if this list includes the other list mentioned this past week at Buffalo Rising. Why go to the Albright-Knox to see the house of mirrors? Walk down a City street, open your eyes, you'll see. Come over to Coe Place. We've got two! Three and half years ago there was vision. Buffalo Spree - March/April 2003 - covered the story of Jessie Schnell's plan for 85 and 91 Genesee Street. It was celebrated. Jessie Schnell's vision and Charles Burchfield's sketch, same place. Where has the vision gone? Today you can see. No where. Early this evening, and right next door there were long lines waiting to see a show at the Icon. 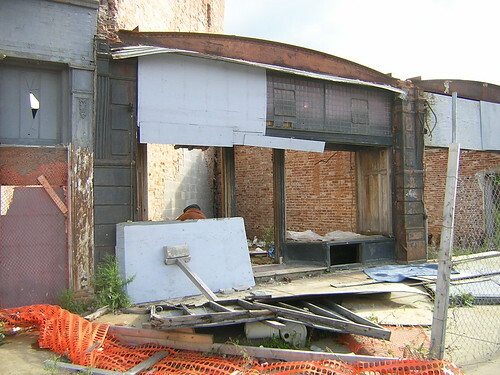 About an hour ago Bradley was there, under a blanket, again in the collapsing remains of an unboarded storefront at 85 Genesee Street. There is the possibility that a more creative developer may come forward in the future to develop the site using the existing structure, and all we have to do is to help keep the building mothballed until that time. Scot, well said. But why do repeated requests to secure this building at 85 Genesee Street go unanswered. Sure we're busy. There are always other projects. Yet, it takes nothing to call a construction or rental company and have a secure fence installed. It's a phone call. That's all. 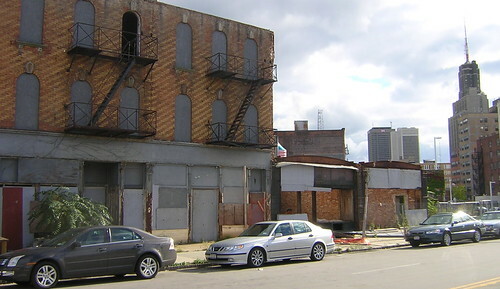 I haven't confirmed the exact amount, but various sources tell me that Triangle Development LLC received up to $45,000 from the City of Buffalo to remediate various structural problems associated with these buildings. If you haven't seen these buildings with your own eyes, you wouldn't believe the long list of public safety and health hazards present here. Here's the location - [google map] 85 and 91 Genesee Street. If there is a building in the downtown core or on the City's near East side in worse shape, show me. 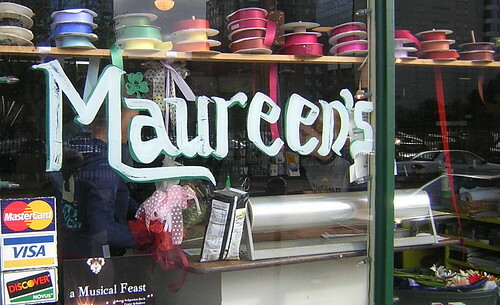 I'll send you a gift certificate for lunch at the restaurant of your choice for two, in Buffalo. Now the question seems to be - who's going to pay for the demolition. Righteous? Please. Even, Carl Paladino returns phone calls. Two related posts from earlier this week and last week involving 85 and 91 Genesee Street. update...here's Charles Burchfield's Street Scene - 91 Genesee Street is on the right hand side of the pic. I remember having lunch with Rob Palano, 12 maybe 13 years ago at Just Pasta. Really engaging guy who knows more about real estate than most. I remember him saying, "It's like monoply. Be prepared. You might just end up in jail." 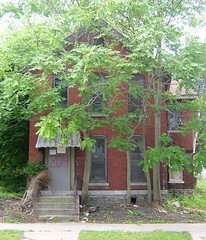 Most of Rob's real estate was here on Buffalo's East side. The Buffalo News, carried the article this week about Rob's sentencing - Predatory Landlord Gets Jail. Seems like New York State Attorney General Elliot Spitzer has had Rob in his sites for some time. Here's a 2001 piece about the sentencing in an earlier case. Also try this [google search - Rob Palano Fraud]. If you are reading this because you are one of the dozens of people that Rob helped, I'd like to hear about your personal experience in dealing with him and especially how he may have helped you buy your first home. Does anyone know how many of these Palano houses are now demolished? Incredibly, a major player in the Palano scams, but never named in the prosecution, is longtime #2 BMHA Atty, James Lagona, who served as Palano’s personal attorney during the entire engineering of the latest scams. As if to underline his role, Lagona “purchased” 43 Palano houses simultaneous to Palano’s abandoning the 100 mortgages to”retire” to Florida (the whereabouts of Palano’s wealthy partner, sister Janet Bryant, also never-charged, are not known to me). See the list of the Lagona (& wife) houses below. BMHA (or HUD, who paid his BMHA salary of about $70K), of course, has no ethical rules forbidding stealing from the poor while working for City Hall’s major “welfare” agency. Lagona retired as the latest Palano scandal was breaking, so he now has a taxpayer-funded pension ($40,000 annually?) . . similar to former BMHA ED Sharon West when she “retired” to Fla with a $50,000 NYS pension, and with a new $90,000 job. Lagona supplements his pension with rents from the poor living in his 43 Palano houses. At merely $1000 net rent per house per year, Lagona is likely getting (well over) $43,000 annually, plus the estimated $40,000 pension . . likely far exceeding $83,000 annually, all for “servicing the poor”. It will be interesting to see how the Buffalo News reports this latest of a long series of inner-city Bflo housing scams. Word is that Rob will most probably serve only 8 months of his one year sentence. Then back to Florida. Just a midweek pic of the reconstruction around lunch time, Thursday. Lots happening. More over the weekend. Plus some awesome roof top shots of the construction site from moi's house. Just learned that Triangle Development LLC will be in Housing Court tomorrow [correction, see comments] morning regarding the property at 85 Genesee Street. The case - index# 1860/2005 - has been in front of Judge Nowak since October, 2005. Here's all the background information. I've already planned to be in Court tomorrow morning involving the matter of 1572 Jefferson Avenue. I'll update on 85 Genesee Street when I learn more, probably tomorrow afternoon. Still no word from Jessie Schnell, President of Forever Elmwood regarding her plans for 85 Genesee Street. Met-up with Amy Kedron at the café this afternoon. She brought me up to date on a new venture, Buffalo First. The future of Buffalo rests upon our ability to develop a strong economy, where employment opportunities are ample and wages high enough for people to adequately meet their needs. While national companies can (and do) generate additional jobs, the benefits they bring to a community are easily negated if local businesses are hurt in the process. As local businesses shut their doors, individuals are forced to clamor for the few (typically lower paying) jobs available locally, or leave town altogether. Either way, Buffalo’s tax base shrinks and the entire region suffers as a consequence. Amy told me that one of their members is located around the corner on Jefferson Avenue. That's Bart William's PrintEFX. It's located in the new Jefferson Marketplace. Checkout the rest of the members, right here. I first met Amy last year and gave her one of my first Artspace backyard home and investment tours. We'll be doing that again, soon. 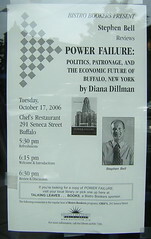 Developing business and keeping money here in Buffalo. Good things. Another book talk. October 17th at Chef's. Click pic on right for details. Here's Diana Dillaway (not Dillman, poster on right) discussing her book on Smart City this past July - link to audiofile - discussing various aspects of sprawl and development. While the analysis here is so much apart of the daily discourse here in Buffalo, NY I think the book could have pushed the ball abit further up the field by naming names and connecting the dots. Smart City is made available by Buffalo's own Hyde Family Foundation. Awesome collection of links, lectures and good things to read. Thanks, George! 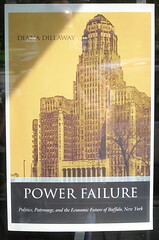 Two days left - Historic Buffalo on eBay. I've had numerous e-mails from a number of out town investors asking about this location and what the future holds for the area [google map - 115 Chicago Street].They check in often so leave your comments below. At least one guy is coming in tomorrow for a look around. Though I've often thought of owning a place like this, I'm not bidding. Buffalo's Catholic heritage remains visible from nearly every street corner on Buffalo's East side - steeples and buildings everywhere you go. Much of this is now ''hollowed out" and slipping further and further from our grasp. Yet, never were the numbers so great as during the centennial celebrations 59 years ago this week. The series of photographs below are from a book that I recently found and just finished reading, Buffalo's Centennial Eucharistic Congress - September 22-25, 1947. Many of the shots - include images of buildings that are still around and some that have slipped away. Nearly 40,000 parochial school children and Catholic youth, the greatest throng ever ot attend a religious event in Buffalo, to-day jammed the Civic Stadium for the second pontifical Mass of the Buffalo Centennial Eucharistic Congress. 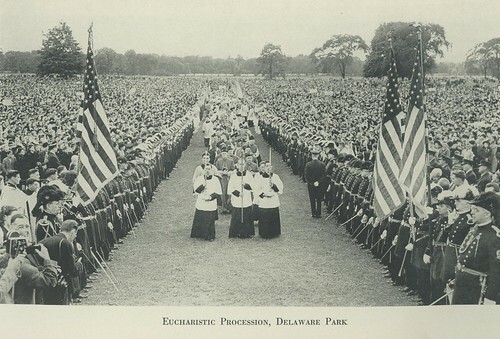 The largest Crowd ever assembled in the history of Buffalo, approximately 200,000, thronged the meadow of Delaware Park yesterday afternoon to offer final adoration to the Holy Eucharist and bring to a close the Buffalo Eucharistic Congress. Some church buildings have become mosques, others are no longer with us and some - if Bishop Kmiec stays the course, will close forever in the second round of Church closings scheduled to begin early next year. And like magic and despite a slew of empty buildings, new ones - like this McChurch, get built. I've been covering various aspects of this story, here in Annals of Neglect. Dalai, next time you're around I'd like to show you the meadow in Delaware Park. Holds more people than that spot out in Amherst. I think you'd like it. It's in the middle of our City. Beautiful, too. Here's the same photo's arranged in a slideshow - Catholic Buffalo, 1947. As I was saying last week - Meeting Bradley - the buildings here at 85 and 91 Genesee Street are a complete and total mess, presenting a long list of public health and safety hazards. I met-up with Greg Heeb, lead attorney from the City on matters impacting these sorts of issues, yesterday. He informed me that in the last few days, the Dept. of Inspections has submitted an affidavit requesting permission for a demolition of 85 Genesee Street. It's in Judge Nowak's hands. My initial research indicates that Triangle Development, LLC is the owner and responsible party for this building and that Jessie Schnell, President of Forever Elmwood, is Triangle Development's representative. I stopped in at the office today desiring to speak with Jessie. Left a message. I hope to have a statement from her regarding her plans for the building, their tenant and the place next door at 91 Genesee Street. I'll post it. In case you missed it, here's the 85 & 91 Genesee slide show from last week. This should be interesting. Stay tuned. Oh, and that's Bradly, huddled-up behind the board. He was there again, last night. If you haven't already done so, make sure to check out some of the amazing photography by Toronto's DK PhotoGroup that I've featured recently - Orphaned in Buffalo and this past weekend's focus on the Sattler Theatre. Back on Wednesday with some breaking demolition news. Located at 134 Masten Avenue at the corner of Dodge, this house was recently built by Burke Homes (aka Rocco Termini) for Belmont Shelter. This is the view from the sidewalk on Dodge Street looking north. It's part of a 30+ home 'Vinyl Village' that's been photoshopped into our City this past year. As of Monday afternoon the house was vacant, big piece of plywood on the front door. 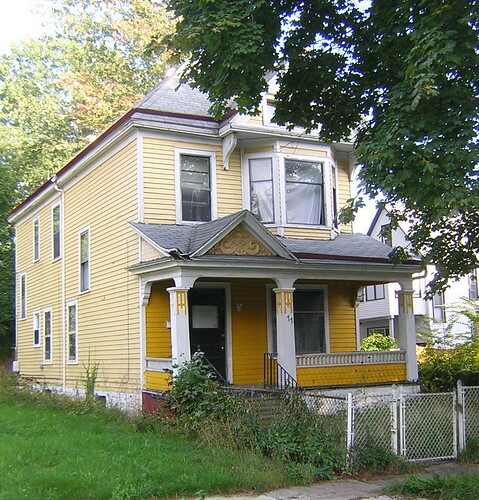 Just off Main Street and in Artspace's backyard is another well cared for home. 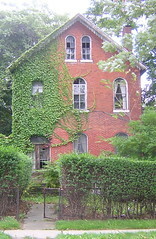 There are many late 19th century brick homes just like this dotting the streets of the City's near East Side, steps from Main Street. Check out the collection - East Side Beauty - updated weekly for additional beautiful spots on the City's near East side. While checking out the 400 block of Ellicott Street this week, I had the opportunity to chat with a few business owners about development and business issues. Longer post later this week about a cool business that now employs 34 people. Let's see if I make it to the roof of this amazing block! 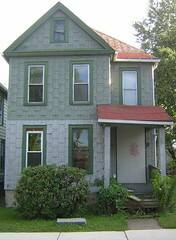 A new fixBuffalo fan, tipped me off to the beauty of this place in Buffalo's Fruit Belt neighborhood. 204 High Street this week. This Italianate beauty is uniquely shaped. It wraps in "L" fashion around a chestnut treed vacant lot at the corner of High and Maple. 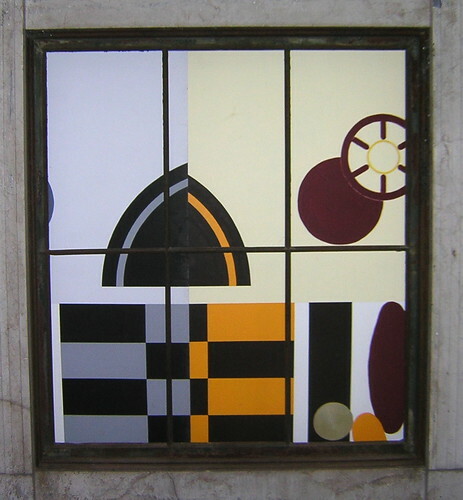 It appears as though the section in the middle, with the three windows, is a connecting structure. One neighbor to told me that 204 was last a doctor's office that closed in 1979. A second neighbor who has lived next door since 1959, said no one has lived or worked here since. This google satellite image reveals the building's unique shape and proximity to Buffalo General Hospital and Roswell Park. The pic on the left is the 291 Maple Street entrance and on the right is 204 High Street. How can we better manage our City's decline? A simple inventory of City-owned property - proximity to new investment as in Medical Corridor, Artspace and Joint School Reconstruction Project schools - would be a good first step. Suggestions? The demolition paperwork is stapled to the door. Imagine, a doctor's office next to a major medical center. Next stop City Hall. This demolition must be stopped. Back to Central Terminal this afternoon. John from Seattle asked moi to provide a City tour for his parents. While John's mom signed the guest book, I noticed that Buffalo News writer Mary Kunz Goldman had recently signed in, too. The artwork below also caught my eye. It's on the wall near the guest book. And for the non German speakers, Mary's Ausgezeichnet! comment means - excellent, as in totally amazing. If you haven't seen it here's Mary's Youtube Premier talking about the East side with Michele Johnson. Wonder if a certain Clarence, NY based blogger will end his weekly diatribe - an adolescent and mocking review of Mary's work. Would be good. The site is still swarming with activity. 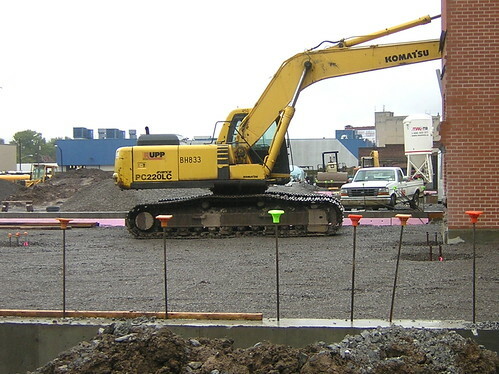 Concrete work around the perimeter of the new and seriously smaller parking lot. Tons of concrete block delivered. Exterior walls going up for the new main entrance. Offerman Stadium's home plate was 25' towards the school in the last little pic below. 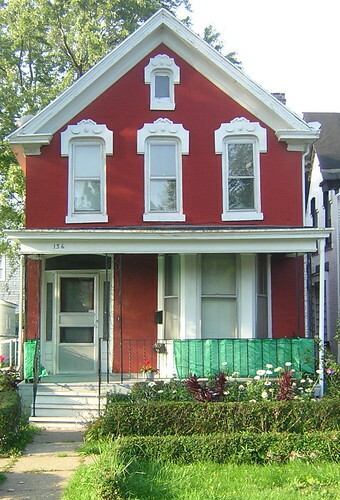 This house at 11 Holland Place is steps from Artspace [google map]. I placed it on my radar in May of 2005 when the current owner Dana Upcher and her husband Venere Hutchinson were picked up in Tennessee on outstanding Housing Court warrants. Here's that story from May and later in June. According to City records the house is still owned by Dana Upcher. There's no longer a Housing Court case for this property. It's vacant and no one lives here. I'm not sure how to reach Dana. Perhaps through Housing Court as her husband is on the installment program for the record $79,000 fines that were imposed at sentencing. I can't imagine she wants much to do with this place. I walked around the property the other day. It appears structurally sound, the roof is newer and with the exception of the porch post on the left, the house is in reasonably good condition. If you are interested in buying this house, let me know. I'll do my best to help locate the owner. Before and During...900 Genesee Street. Late Notice - Coe Place Block Club Mtg. Buffalo's only Down Town Beach! "Hello, may I speak to Chris Jacobs..."